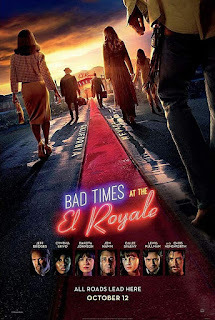 Read Ashley K's review of Bad Times at The El Royale. Seven strangers, each with a secret to bury, meet at Lake Tahoe’s El Royale, a rundown hotel with a dark past. Over the course of one fateful night, everyone will have a last shot at redemption… before everything goes to hell. 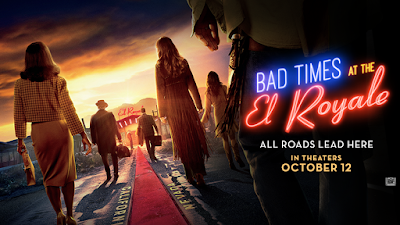 Jeff Bridges, Chris Hemsworth, Jon Hamm, Dakota Johnson and Cynthia Erivo lead an all-star cast in BAD TIMES AT THE EL ROYALE. With an amazing cast including John Hamm and Jeff Bridges this movie brings a unique style to the genre. Cynthia Erivo stole the show as Darlene, an aspiring singer with the voice of an angel. 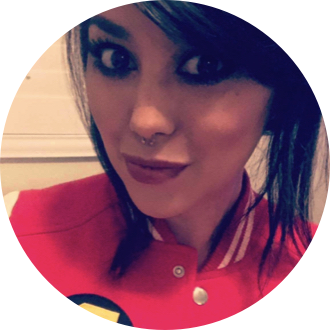 She stands up against men who think they can have whatever power they want over women. Many different characters from all backgrounds - I’m sure you’ll find a favorite too! The movie was very entertaining but also felt long at times. You see the characters from different perspectives but it’s all part of the same story, it starts to feel a bit draining towards the end. I got a very “Tarantino” feel from this film, if you like interesting art house movies you’ll like this one.